Uganda Wildlife Safaris, Rhinos, Chimpanzees, Gorilla Tours and Nature Expeditions. The Safari takes you to Murchison Falls, Kibale Forest, Queen Elizabeth, Mgahinga and Lake Mburo National Parks. When you land t Entebbe Airport, our driver guide will pick you up to transfer to Kampala for overnight at Cassia Lodge, Le Petit Village, Protea Hotel or Hotel Africana on bed and breakfast. Day 2: Drive To Murchison Falls, do Rhino Tracking en route. Drive from Kampala to Murchison Falls National Park early in the morning and it will take you about six hours. Along the way, enjoy rhino tracking at Ziwa Rhino Sanctuary in Nakasongola district. 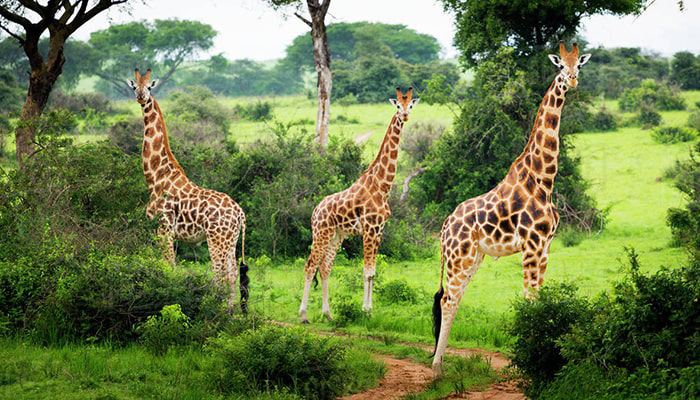 Murchison Falls National Park features Savannah, riverine forest and wood. There are a variety of animal species that include lions, leopards, elephants, giraffes, hartebeest, oribis, Uganda kobs and number of bird species that one enjoys while trekking chimpanzees. The journey will offer you with great views that are charming to reach the park in the afternoon. Dinner and overnight at Paraa Safari Lodge or Murchison River Lodge on full board. Have your breakfast and set off for Kibale National park, having lunch enroute. Arrive in the evening. Overnight Ndali Lodge, Primates Lodge, Fort Motel, Mountains of the Moon Hotel, Toro Resort, Chimps Nest and many more descent lodges around Kibale or Fort-portal. Day 5: Take a Chimpanzee Trek and Bigodi Nature Walk in the evening. Have breakfast in the morning and then after start your trekking excursions pass by Kanyanchu Tourist Centre to these amazing Uganda chimps. It is a beautiful experience to stare at them as they bicker and play in fruiting trees. The trek will give you an opportunity to view a range of primates, Birds and Butterflies through a network of shady forest trail. You will reach the Uganda wildlife headquarters for briefing about tracking and the forest walks. You will then walk along the different tracks in the forest in groups searching for apes. As you walk, you may stop to listen to the noises of the chimps as you pass by them. The guided walk peovide information about chimps, other primates, fauna and flora making it informative and mesmerizing. After the walk, enjoy your lunch and go to do a nature walk to Bigodi wetland sanctuary, it has a lot of rare species to offer, both animals and birds. Dinner and Overnight at Ndali Lodge, Primate Lodge, Fort Motel, Mountains of the Moon Hotel and Toro Resort. Day 6: Transfer to Queen Elizabeth Park, do an evening Boat Cruise. After early breakfast, report to the ranger station before 8:00 am for registration and a short briefing by one of the rangers at the park headquarters. With your packed lunch, you will then set off at around 9:00 am in the thick forest to look for these exciting apes. You will also enjoy the ecstasy of seeing the gorillas brushing up, feeding and playing pleasantly. Enjoy an early breakfast and leave for Lake Mburo National Park. This lovely drive of about 7-8 hours will take you to Mbarara where you will stop for lunch before making the last drop to Lake Mburo National Park. After your arrival, you will go for a boat trip; this park, an extension of the Tanzanian Plains with big herds of Zebra, Impala, Eland and other Savannah species. For birders, the park has 313 different bird species like the rare Shoe-bill Stork, African Fin foot, Pelicans, Black crake, Heron, cormorant, fish eagle the rare Shoe-bill stork, White-winged Warblers, Black-billed Barbet, Crested Francolin, Brown Parrot, Red necked Spur, Emerald-spotted Wood Dove, Temminck’s Courser, common Quails, Greenwood Hooper, Blue-napped Mouse bird, Barefaced Go-away bird, African-Grey Horn-bill, Nubian Woodpecker, Trilling Cisticola, Lilac-breasted Roller, Coqui Francolin, Red necked spur fowl, Black Bellied Bustard, African-wattled Plover Rufous napped and Flappet larks, Rufous chested Swallow , Southern Red Bishop and Yellow-throated Long claw among others. You will take an evening boat trip on the eastern shoreline of Lake Mburo. The lake is adventured well by boat, departing from a pier at the lakeside camp near Rwonyo. You will see crocodiles and hippos during the 2-hour voyage, as well as birds including fish eagle, heron, cormorant and pelicans and unusual shoe bill stock. After a boat cruise, drive to the lodge for overnight at Mantana Tented Camp, Rwakobo Rock Hotel, Mburo Safari Lodge will all meals served. After an early breakfast, take on a morning game drive providing an opportunity to view impalas, warthogs, elands, topis, water bucks and zebras. You will relax at the park for the rest of afternoon and evening. Overnight stay at Rwakobo Rock Hotel, Mantana Tented Camp, Mburo Safari Lodge with all meals served. Day 11: Nature Walk and Depart for Kampala. After breakfast, have a guided nature walk that include Forest Walks through Rubanga Forest on the western side of Mburo is charaterised by tropical high forest with canopy and is a dwelling place several woodland birds. Salt Lick Guided walks, with these one, you explore the park around Rwonyo, culminating in a visit to a natural salt lick frequented by wildlife. Viewing is enabled by a timber observation podium. After the nature walks, you continue to Kampala which is about 3 to 4 hours drive. This drive will take you across the Equator where you will stop for a photogenic break. Arrive in Kampala in the evening to retire to your hotel. This day is only for Entebbe Airport Transfer for a next flight, marking the end of Uganda Gorilla Safari & Wildlife Tour.